Bhagyashree Patwardhan is an Indian actress. She is best known for her debut lead role in the film Maine Pyar Kiya, for which she won the Filmfare Award for Best Female Debut. She has appeared in Hindi, Kannada, Marathi, Telugu and Bhojpuri films. 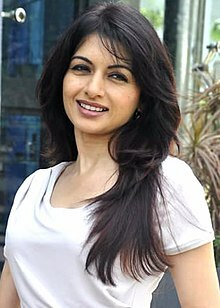 Bhagyashree hails from the Patwardhan royal Marathi family of Sangli in Maharashtra. Her father, Vijay Singhrao Madhavrao Patwardhan, is the current Raja of Sangli. She is the eldest of three daughters, the other two being Madhuvanti and Purnima. She is married to Himalaya Dasani. She started her acting career with Kachchi Dhoop – a television serial by Amol Palekar. It was based on Louisa May Alcott's Little Women. Her rendezvous with acting happened by chance, when next-door neighbor Amol Palekar, a renowned actor-director, requested her to step in and act in his serial Kacchi Dhoop, as the actress who had been signed on had abandoned the serial abruptly. She made her film debut in the 1989 blockbuster film Maine Pyaar Kiya with Salman Khan. This remains her most successful and best known film to date. After marriage, she acted in three films: Peepat's Qaid Main Hai Bulbul, K.C. Bokadia's Tyagi and Mahendra Shah's Paayal, all opposite her husband in 1992. She also acted with Avinash Wadhawan in Ghar Aaya Mera Pardesi (1993). This was her last Hindi film in the 1990s and she went on to appear in a few Tamil and Telugu films. She made her Telugu debut in the film Yuvaratna Rana (1998). She also made appearances in many television series. She returned to Hindi films in the mid 2000s appearing in Maa Santoshi Maa (2003), Humko Deewana Kar Gaye (2006) and Red Alert: The War Within (2010). After a gap of several years, she made her comeback to television with the TV serial Laut Aao Trisha aired on Life OK from 2014 to 2015. She is also set to return to films with the Telugu remake of the 2014 Hindi film 2 States. Bhagyashree is the promoter of the media company Shrishti Entertainment with her husband. In March 2015, Bhagyashree became brand ambassador of the Bhagyashree Scheme, launched by the Government of Maharashtra. Bhagyashree Scheme caters to girl child from below poverty line families. ^ a b IANS (13 July 2014). "I never went away from my fans: Bhagyashree". The Indian Express. Retrieved 17 July 2016. ^ "'Patwardhan Royal Family'". Royal Ark. ^ "Beyond the coyness..." The Hindu. Chennai, India. 19 March 2011. ^ "' I like to know all the details of my role beforehand' : Bhagyashree". Indian Television Dot Com. 22 August 2002. ^ "Bhagyashree: I have no regrets". Rediff. 22 January 2016. Retrieved 17 July 2016. ^ "I'm happy to be known as 'Maine Pyar Kiya' girl: Bhagyashree". Yahoo!. Archived from the original on 21 May 2009. Retrieved 22 October 2010. ^ "Bhagyashree Patwardhan back to screens with Laut Aao Trisha". IANS. news.biharprabha.com. Retrieved 17 June 2014. ^ "Maharashtra Government launches Bhagyashree Scheme for girl child, to be linked with Beti Bachao, Beti Padhao Scheme". intoday.in. ^ PTI. "'Bhagyashree' scheme for girls in Maharashtra". The Hindu Business Line. ^ "Coming of age: Bhagyashree made her debut with Kachchi Dhoop". 4 March 2016. Retrieved 27 June 2018. ^ Hegde, Rajul (17 July 2014). "Bhagyashree: Salman is looking incredibly good now". Rediff. Retrieved 17 July 2016. ^ "Bhagyashree Returns to Small Screen with Life OK's New Show". TellyTRP.in. 25 March 2014. Retrieved 25 March 2014. Wikimedia Commons has media related to Bhagyashree Patwardhan.